A good friend was visiting me few days back, so I asked her what she would like to eat and I would cook for her. 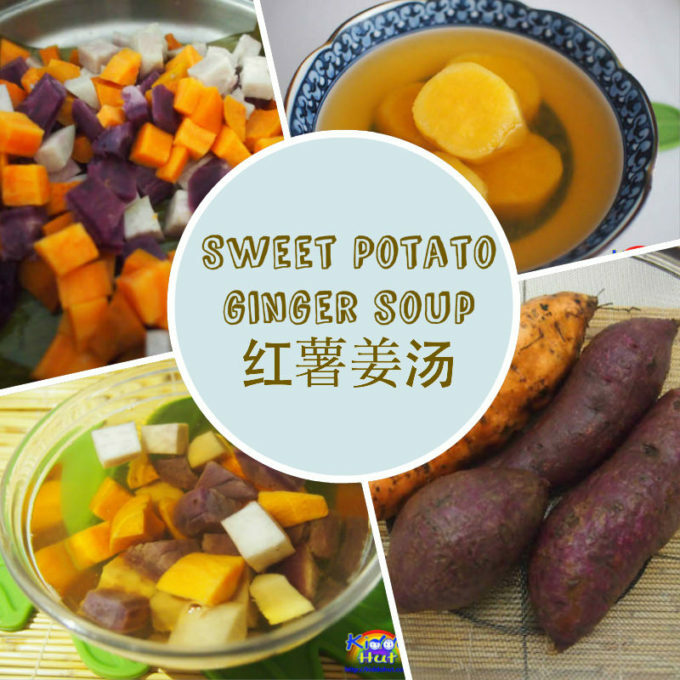 She requested for Sweet Potato Ginger Soup 红薯姜汤. Good thing was, my elder sister was just back from Japan and brought back a beautiful purple skin (white flesh) sweet potato. I have old ginger and sweet potato at home, so this request was a simple task for me. Old ginger is known to be able to warm our body, hence is a natural remedy for cold and flu and especially good for cold weather. Apparently, it can calm upset stomach and treat morning sickness as well as colic. It has strong anti-inflammatory properties that can help treat the pain associated with gout, rheumatoid arthritis and osteoarthritis. Old ginger is more fibrous, drier and more spicy compared to young ginger. Sweet potato has very high Vitamin A and especially good for children. It has anti-oxident and anti-inflammatory nutrients too. Sweet potato is best kept in a cool, dark and well-ventilated place. Sweet potato comes in various colours and different colours have different texture. The red / orange ones are more moist and soft whereas the purple ones are more grainy. I cooked my ginger sweet potato soup using the rice cooker under the ‘porridge’ mode instead of over the stove so that I do not need to keep an eye on the fire. If you are cooking it over the stove, do cover the pot while cooking and top up water where necessary. This is a very easy recipe and using the rice cooker saves you more effort. In fact, I have also added some yam cubes for variety, which is optional. 1. Wash and cut the sweet potato to big pieces. Wash and slice the old ginger to 5 slices. 2. Put all ingredients except the honey rock sugar into a pot and bring to boil under high heat. 3. Once boil, turn heat to medium low and continue to boil (covered) for 30 minutes. 4. Add sugar to taste. Serve.